SYNOPSIS: Sent to a boarding school in Ancelstierre as a young child, Sabriel has had little experience with the random power of Free Magic or the Dead who refuse to stay dead in the Old Kingdom. But during her final semester, her father, the Abhorsen, goes missing, and Sabriel knows she must enter the Old Kingdom to find him. Four sees all in frozen water. 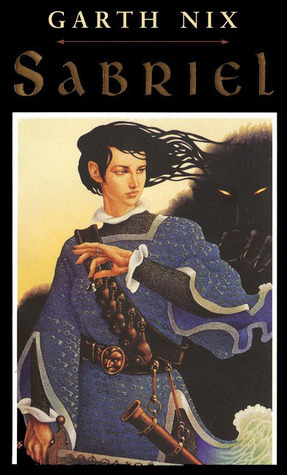 I first read Sabriel as a preteen, and while I know I loved it – I must have, as I asked my parents to buy me the second book in the series, too – I never continued the series, nor did I remember any of the details whatsoever. In recent years, I met so many people who cherish this series that I just knew I had to reread the first book, and I’m so glad that I did. While this wasn’t a perfect read for me by any means, it set the stage for what I genuinely believe is going to be an incredible series. I’m such a sucker for necromancy books in general, and the way the world of the Dead and the Abhorsens is created in this book is wonderful, but not as fleshed out as I hoped it would be. I adored every single sentence about the world of the Dead, the bells, the magic, and the ways in which Abhorsens (Sabriel’s family of necromancers) interact with all of the above, but it was never quite enough. Had I gotten an extra 50-100 pages of pure, unadulterated world-building, I believe this would have been a 4-star read for me, if not better. That said, the setup we do get is magnificent: the act of necromancy is portrayed in such a fascinating and risky way, and the Dead themselves are downright creepy. These aren’t wispy ghosts and quiet whispers in shadowy halls; these are looming, vicious creatures, on a mission to regain their status among the living, no matter the cost. Death and what came after death was no great mystery to Sabriel. She just wished it was. The second double-edged sword in this book was Sabriel’s character, who I wanted so badly to love – and I did love, by the end – but I had such a hard time connecting to her! She feels very ingenuine for the first 2/3 or so of the book. Any time she feels a particularly strong emotion, it’s described to us, but in a way that feels too clinical and detached to relate to. I think this was definitely just a sign of inexperienced writing, because even by the end of the book, I was able to connect with her more solidly, and I hear that this particular writing issue is one that is resolved in the other books in this series. Even without feeling like Sabriel is a three-dimensional, complex character, I still soundly enjoyed who she had the potential to be. She’s tough, intelligent, and warm, without an evil bone in her body. I think the biggest reason her lack of development frustrated me was simply because, with better writing, I could have seen Sabriel becoming one of my absolute favorite heroines (and, in fact, I do remember adoring her as a child). Finally, the reason I just could not bring myself to give this book a higher rating: insta-love. Funny enough, it was more of an issue with the love interest than it was with Sabriel (which, at the very least, was a refreshing change from the trope of the female in an f/m relationship being the first to fall). I won’t give any spoilers, but I will say that the quote I used at the heading of this section actually made me laugh out loud and roll my eyes a little bit. It’s not just that these two characters spend so little time together before confessing their love; it’s also a matter of the fact that they barely speak to one another throughout the entire book, as most of their limited time together is a tumultuous, stressful, and fairly quiet journey. On the other hand, a fellow blogger recently gave me some interesting food for thought: insta-love can be used as a plot device, to depict how naïve the characters are, and that could easily be said for the pairing in Sabriel. If that was the author’s intentions, I can respect it, but I still don’t feel like it was the best route; in fact, I think my preference would’ve been for this book to be entire romance-free. All in all, this book has a lot of flaws, but it’s got so much potential and such an interesting and unique storyline that I would ask you not to let this 3-star rating convince you for a moment that I didn’t enjoy it. On the contrary, I had a wonderful time rereading Sabriel, and I’ve already ordered myself a new copy of the second book so that I can see what else Garth Nix has in store for the series. I did this on audio so I think Tim Curry just sold it to me whole heartenly. I do think you have a lot of good points about the book’s flaws. My fiancé listened to it as well and he said Tim’s narration was phenomenal! It was sooooo good! This was such a fun buddy read with you! He really made the book for me! I listened to him narrate “Lireal” as well, and it was a amazing as well! I really need to read his books. Awesome review! Thanks, Cody! If you get the chance to check them out soon, I hope you enjoy! Thank you, Hannah! I’m glad I’m not alone about that romance, lol. I’m so glad to hear the other books are so great, though! I ordered Lirael from BookDepository a couple of days ago because I wanted the AUS cover, and I think I’m gonna start on it whenever it arrives! I really hope you’re gonna love this one and I can’t wait to read your thoughts on it! I am curious what you think of book 2, because I’ve only read the first one as well and liked it less than I expected to and want to see if the series gets better.